The nail-polish comes in an acrylic-pot (see-through) with a matte-black lid. *The brush is really amazing,it helps in easy application of the product on nails. *The product is not runny or gloopy in nature. *The product has been nicely formulated to set quickly. Overall,Inglot's O2M breathable soft matte nail-enamel collection is really nice. There are sixteen vibrant shades to choose from. I like the shade that I have picked! I highly recommend this nail-paint. 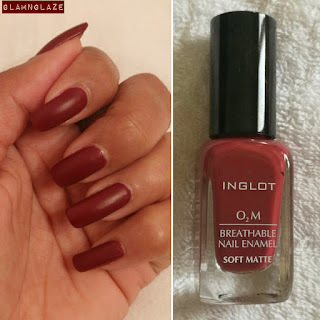 You must check out the O2M breathable soft matte nail-enamel collection by Inglot!